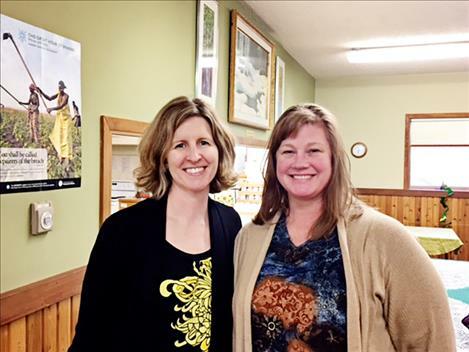 Polson Middle School teachers Leslie Dalbey and Carrie Lapierre recently received scholarships for further schooling. POLSON – Two Polson Middle School teachers recently received local and state scholarships as they pursue master’s degrees in education. Leslie Dalbey, seventh grade life science, and Carrie Lapierre, seventh and eighth grade math, belong to Delta Kappa Gamma, a service organization for outstanding women educators. They were awarded $500 scholarships from the local Upsilon chapter, and each received a $1,000 scholarship from Alpha Mu State as well. Dalbey will complete her master’s degree in science education from Montana State University, Bozeman; Lapierre is earning a second master’s degree, this one in curriculum and instruction from Montana State University, Billings. Both teachers were recognized for their commitment in the classroom, as well as the many ways they contribute to DKG and the community.